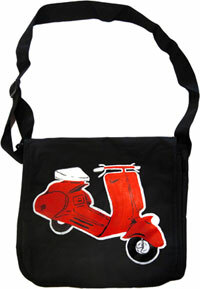 Maybe it’s my eyes, but the Vespa on this Vespa messenger bag seems a little out of proportion! Saying that, it’s probably intentional, as this bag from Ex-Boyfriend (like all the bags in their range) is painted by hand. The bag features adjustable straps, front clasp closure and a main pocket with inside slip pocket. Measuring up at 13.5 x 12 x 5 inches, you can pick one up for $50 (around £26).